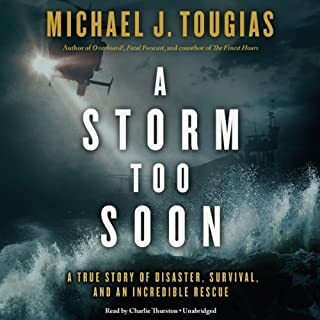 Seventy-foot waves batter a torn life raft 250 miles out tosea in one of the world's most dangerous places, the Gulf Stream. Hanging on to the raft are three men, a Canadian, a Brit, and their captain, Jean Pierre de Lutz, a dual citizen of America and France. Their capsized forty-seven-foot sailboat has filled with water and disappeared below the tempestuous sea. The giant waves repeatedly toss the men out of their tiny vessel, and JP, with ninebroken ribs, is hypothermic and on the verge of death. United States Coast Guard "Semper Paratus"
Before The Perfect Storm, before In the Heart of the Sea, Steven Callahan's Adrift chronicled one of the most astounding voyages of the century and one of the great sea adventures of all time. In some ways the model for the new wave of adventure books, Adrift is now an undeniable seafaring classic, a riveting firsthand account by the only man known to have survived for more than a month alone at sea, fighting for his life in an inflatable raft after his small sloop capsized. In early May of 2005, Captain Tom Tighe and first mate, Loch Reidy, of the sailboat Almeisan welcomed three new crew members, two men and a woman, for a five-day voyage from Connecticut to Bermuda. While Tighe and Reidy had made the journey countless times, the rest of the crew were paying passengers learning about offshore sailing—and looking for adventure. Four days into their voyage, they got adventure but nothing that they had expected or had any training to handle. A massive storm struck, sweeping Tighe and Reidy from the boat. The remaining crew members somehow managed to stay aboard the vessel as it was torn apart by wind and water. Overboard! 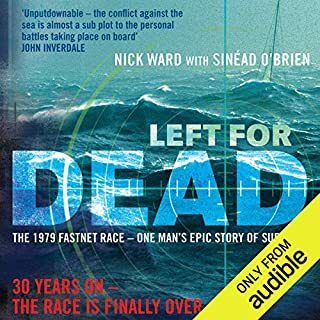 follows the simultaneous desperate struggles of boat passengers and the captain and first mate fighting for their lives in the sea. ©2010 Michael J. Tougias (P)2010 Blackstone Audio, Inc. THANK GOD! Remember the anticipation, the dread of "Jaws"? Well, to me, this was even more intense, AND non-stop! I found myself pacing when I was in my office, and when I tried listening in bed, I couldn't relax enough to sleep (don't try it). Suspenseful? Oh...I'd say so. It felt like a 6-hour roller coaster ride! This novel has set a new standard by which I can judge "Uplifting"
Succinctly stated "This novel had it all." Character development, pacing, amount of detail needed to visualize what was going on, the storyline. From beginning, middle, to an ending that brought tears to my eyes and was the epitome of uplifting, I thoroughly enjoyed this masterful work of nonfiction. What a harrowing experience at sea! 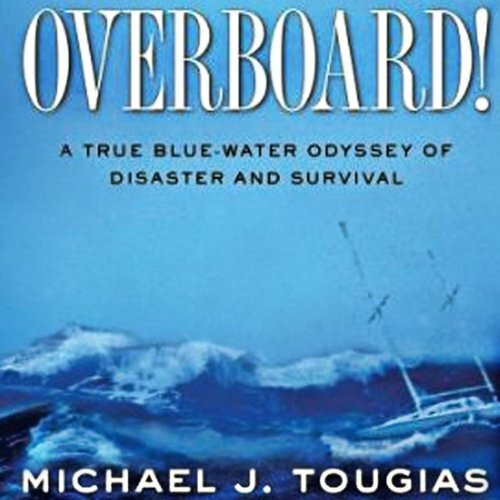 Wow, “Overboard!” written by Michael J. Tougias, was quite a miraculous true life survival story. 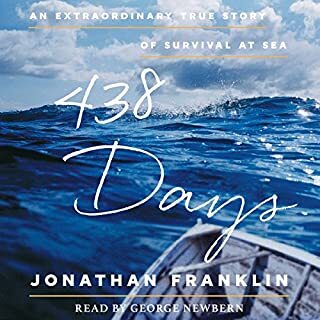 I really enjoyed all of the descriptions of what happened at sea and the suspense about who would survive the sailing trip. I was also impressed by the Coast Guard rescue teams. The narrator, Malcolm Hillgartner, did a great job. The story is quite an adventure. You will not be sorry you listened to it. The author taught me about sailing and drew me into the action. The narration was good, too. I never got bored, and I never regretted the purchase. That's good enough for me. Worth the time & money. Would you consider the audio edition of Overboard! to be better than the print version? I wouldn't know whether or not the audiobook is better than the print version since I didn't read the print version. The story was well told, the writer kept it interesting throughout the telling and didn't over-dramatize the events covered. Which character – as performed by Malcolm Hillgartner – was your favorite? The captain and the first mate were the most interesting because their experiences were so much more extreme than the experience of the other people involved. The time before the first mate was rescued was pretty amazing. 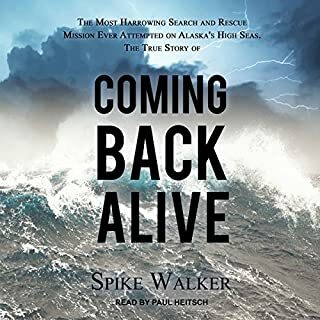 This was good story of adventure and survival, if you're in to this genre, you should enjoy it. Amazing, suspenseful, and very touching story. pronounce them. The one that was most striking to me was the EPIRB device. My daughter, a professional Master 100 ton (currently a yacht captain) has always pronounced this "ee perb" Despite this minor issue, it was an excellent performance. The performance, coupled with the highly detailed story, made for excellent listening. The cadence and tone of the presenter always seemed to hit the right note. The tale was not sensationalized--the performer let the suspense of the story reveal itself. It's easy to care for every person involved in the voyage and the rescue. Well done, everyone! Peace and fair winds to you all! I feel worn out & drained! Good job! I feel I've been through the torrential wash with them non stop! This book has all the suspense of a Hollywood blockbuster. 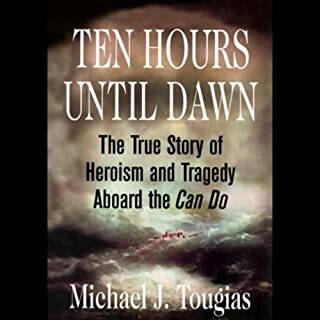 I would recommend this incredible tale to all who love suspense, danger and the high seas. What other book might you compare Overboard! to and why? I can't think of a similar book. This is really different. My favorite scene had to be the one where Loch Reidy is fighting to stay alive , floating on 30 foot waves while circling the rescue ship, who doesn't see him. It did neither. However, I felt a heart pounding excitement while listening and did not want to stop. Exceptional book! 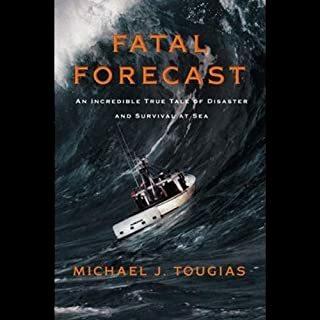 It started out like "any other disaster at sea" book where a small craft is endangered by a huge storm. Where it goes from there you will not believe! I have over 1000 audible books in my library and this has to be in the top 10!! It is a gripping tale that is well-told. The narration is excellent too. I didn’t hit pause or stop once I started this book because I had to find out what happened next.